If you remember a previous post about my favourite resource for live music in Ottawa, then you may be as sad as I was to find out that Stillepost.ca has been shutdown. And that, Dear Reader, is how My Ottawa Show Listings was born. 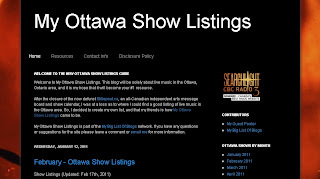 Recently My Ottawa Show Listings made it to the 2nd round of CBC Radio3's Searchlight Contest for Best Canadian Music Website. It made the first cut from over 100 sites down to 60. However it did not make the third round cut that cut the list down to the top 30 sites, which happened just a few hours ago. Oh well, better luck next time My Ottawa Show Listings. If you like live music and find the resource useful, please share My Ottawa Show Listings with all your friends. Also, if anyone would like to help keep the site up-to-date I could really use the help.